Sy tension.. dan tengok lah sy dah buat ape huhu..
Hmm.. hari ni sy rase sedih dan kecewe dan kecik ati.. nape? Takmo citer.. tp sedey la nape org expect bende yang sy tak leh buat. Tp kan, ade 2 bende yg bg senyum sy sgt la lebar ala Julia Roberts. 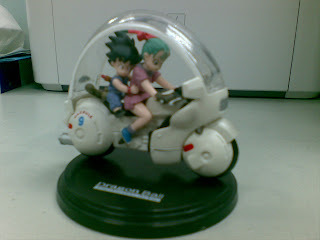 Hehe.. yg ni dpt offer! Ghege asal RM59.90, tadi dpt RM39.90. Mule mmg tanak beli sbb nak beli adiah utk student sy je.. tp tak tahan laaaa hehe.. sbb tinggal satu je lagi. Ni pun kire display unit.. Akhirnye!! Wpun ianye curry ayam sahaje (still kempunan kari daging!) tp MasyaAllah punye sedap! Serius.. rase mcm mak² buat! And kaler nye sgt kuning (maafkan kualiti gambar ye..).. jugak seperti mak² buat dan bukan mcm kedai² jual yg pucat lesi itu..
Dan saiznye sgt la besar.. kenyang sy! 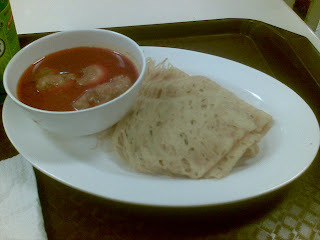 Tu pun, sempat lagi tapau satu lagi set sblm balik dan mak cik yg jual dia food court itu gelak sambil tanye sy, "Kan ke adik ni dah makan tadi?" Sy senyum tersipu² sahaje hehe.. So skrg sy rase sgt happy! 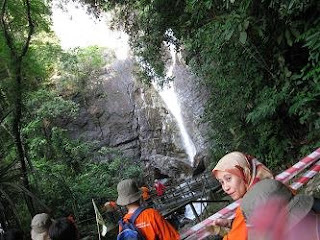 So there we were, menuruni bukit from the PBA waterfall. The 'downhill' trip was of course not as tiring as going uphill. 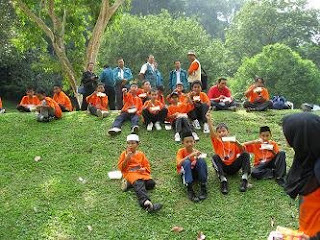 Tu yg Hassan and Aqmal siap bleh 'peace' kat camera tuh..
Then we had our brunch a'la picnic style in the Botanical Garden. Picnic aje kan kitorg hehe.. ni lagi real a since it was in a real park :D The guys in green were from the Jabatan Alam Sekitar (JAS) for our next activity. Not sure if they ate with us ke tak..
Sgt ampeh la diorg kaaan.. but I still like the picture above hehe.. so thanx to sape yg amik! Hahah.. though no thanx sbb ade gak gambo seterusnye yg agak la memalukan kaaan hehe..
Then we went to regroup a bit further on to hear the briefing from JAS. Tu pun, sambil tunggu, sempat ade budak (Adam ke?) relax bukan main je kat situ..
..and the briefing from JAS. 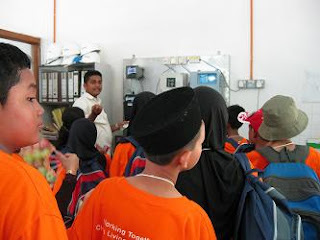 After that, we went to the stream to do some water quality testing with JAS. While our own staff did the test using our own equipment jugak.. just for comparison. ..and whats this? Nape sumer org sengih while OSM was trying to capture something on his group's camera? And tadaaa.. this was the rascal EVERYONE was trying to capture on their cameras! Chumel kan? Sgt beze from the usual monkeys 'strolling' around the Botanical Gardens. Arrived at the jetty in Sg Pinang after a 20-minute bus ride where we tried (but failed) to get some shut-eye. 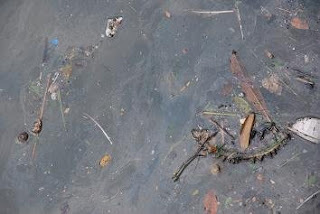 Though seeing the water here, takde nye sesape nak feeling kat sini.. right? Enter the Raja Sungai, Ir Nasehir Khan! Took us towards the end of the pier to look at the water around us. 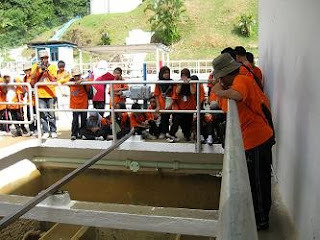 Then we headed back to the jetty to get the results from the water quality test..
..before literally climbing up the bus to go back to USM. Sunyi sepi bus otw back, except for the Jr Fasis (tidak termasuk Farid and Hanif) yg Innalillah punye bising! Iyer.. not MasyaAllah since that is reserved for the beauty of God's creation, but Innalillah! Seriously la you big kids ni cam budak kecik la pulak. Arrived at USM and we had such a hard time waking up the kids. Farid and Hanif (both who got the best Jr Fasis') tido punye nyenyak (they really worked hard at being Junior Facilitators.. no wonder they won!) sampai punye susah la nak ngejutnye! Hanif even called me 'mak' when I finally managed to wake him up hahah..
That night plak, had another session with Raja Sungai..
..then finished up on the scrapbooks and posters for the next day which was already the final day of the program. I 'forced' my group to stay-up till 12am top finish their scrapbook since they had sooooo much ideas but never finished! 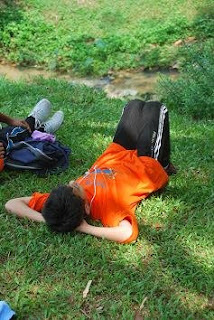 Just got back from Kuala Woh and still haven't gotten over being exhausted (alasan je ni!) hehe.. I'll update on that later since Sedim punye update pun lum abis kan but suffice to say I enjoy the Sedim Expedition more.. 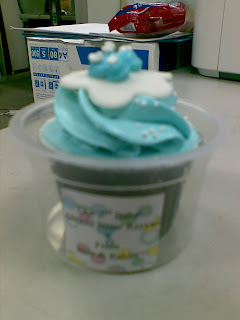 Anyway, came to school and was greeted by a cute cupcake given by Irnis..
..for the birth of her second son, Ahmad Nizar Rayyan :) Thanx Irnis. I especially love the cute booties there on the cupcake hehe..
Then I went to the bank and stumbled upon a quaint gift shop yg you tak kan perasan kot sbb sgt la kecik and chumel. What did I find? Next morning was another rise and shine moment as we had to board the bus at 7am. Brought some bihun for everyone's breakfast to eat in the bus. The journey took some time as we were heading towards the Botanical Gardens in the island of Penang so most of us managed to catch a few more winks in the bus. ..and once again "Barisan cantikkk, barisan lurusss.."
Heheh.. cam caterpillar kan.. or that game we used to play when smaller, Ibu Ayam & Anak Ayam :D Cume tadek 'musang' je kat depan tu..
..and finally we arrived at our destination! Yeay! But whats this? Aiyak, kene panjat lagik ke?!?! Uwaaaaaaaaaaaa..
Sampai je kat atas, everyone found a spot to rest their tired legs. Tapi yg heran tu tgk org² tua selambe je jogging besides us hehe.. TANPE muke yg letih! Then, as usual, had the briefing. this one by En Azizan whom I had dealt with last year for the same activity. 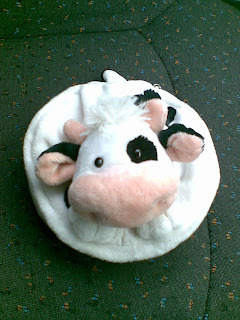 Then, "The wheels of the bus go round and round.. round and round.. round and round.." Heheh, tah pape tak adik² ni main. At first I was afraid they had usik certain devices but turned out those 'wheels' are no longer used, replaced by modern machinery. After that we were taken to the most looked-forward-to place in the plant. But at first.. Yup! You got it right, kene panjat LAGI! ..dan lagi! Sampai terase lenguh kaki² ku ini..
Then of course, ape gune camera? 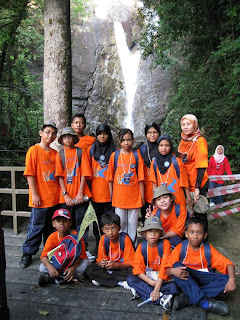 Took a snap of my group (notice I'm not in it :D) before descending..
Ni plak while the kids found excuse to NOT walk another milimeter by pretending to ask questions hehe..
Then, what would an outing do without a group photo, right? Heheh..
Ughh.. 'nightmare' in front of my door! Hmm.. asyik citer pasal Sedim je kan, this entry a bit different. I'm in school, wanting to finish up a few tasks before going to Kuala Woh (not sure of the spelling, aci?) on tomorrow morning (or maybe late tonight ~ depends on the outcome of our discussion nnt!). Huhu, nak bg ilang rase bersalah la tu sbb nak cuti Friday and Monday haha.. Anyway, I came back from my class as usual around 10.15pm and since I had planned to go to school, I just parked outside my house, wanting a quick dash inside to pray before going out again. As I neared the front door of the house, I noticed something unusual right in front of the door. Squinting (I don't actually have a 20-20 vision kaaaan), I realized it was something quite big (about one and a half 'penumbuk').. and it had eyes!!! God! There must be something wrong with my house nowadays. Only last week, on Wednesday jugak a smaller version of it had entered my house and I had to ask for assistance from Salleh (lucky for me since they just moved in two doors away) to throw it away.. ughhh! ..and today! A gigantic version of it. Even Arep who helped to shoo it away this time was suprised at its size.. giler tul! Why?!?! And of all things, my next door neighbour pun kuar sibuk nak tau what happened. Arep dah gelak², sy dah termalu coz all this while sy sgt sombong dengan mereka hahah.. and paling memalukan when I heard him go inside his house telling his housemates, "K**** je..!" Sheeshhh.. that teaches me to run away from my neighbours kan! Sib baik ade Arep.. tenkiu cik adik! First was a quick briefing by the rangers on what to do. Sy ngan berlagaknye tak dengar sgt sebab dah tau hehe.. Then we had to assist our groups in the making of the info cards. Some almost complete ones.. memasing tgk kiri kanan wanna compare with their friends hehe..
Then some winners were announced. Here is Adib getting his prize. The others were Hadi, Aisyah, Afiqah and OSM. After some fun with the herbarium, we had our lunch before heading back to USM. 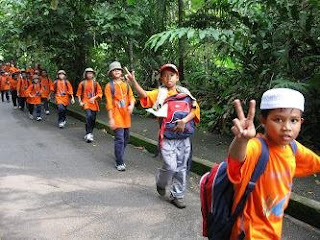 To once again la bebudak ni kene beratur..
"Barisan cantik, barisan luruuuuss.. angkat tangan, kaki rapat.. lurus barisaaann" Though otw back, terdapat lagu dan ikrar 'baru' led by Fattah. Sungguh la ampeh budak ini, abis nameku dijual! Sampai je kat bas, upenye CMs kene tolong buh beg dlm bus la pulak since the kids sumer dah naik bus and tanak turun (kes berebut bus!) Sabo je laaaa.. Arrived at USM after everyone had a chance to sleep on the two-hour ride back. Then had some tea before we asked the students to continue with their scrapbook and discuss what they wanted to do for talentime. Around 6pm, we retired to our rooms to freshen up and pray. That night, all headed to our school. The talentime was to be held there. Sampai je, since our VIP had not arrived yet, the room was a total chaos. 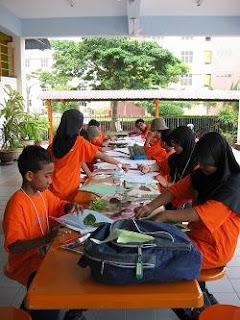 Ade yg bising bersembang laa.. ade yang hafal skrip.. ..ade yang siapkan scrapbook! Ni plak were the junior fasis getting ready for THEIR performance! The teachers were appointed the judges for the performances. 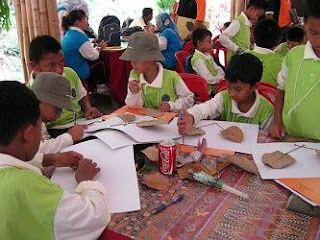 Thus, started the talentime with the first group, Dragonfly..
Ni my group, Hydra, getting ready to start..
Fourth group, Crab or better known as Crabby Patty in Mazlan's books hehe.. 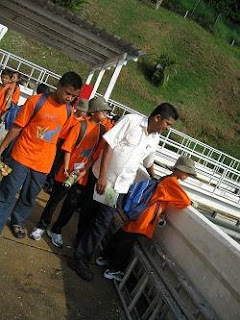 This picture ni sy mcm tau je mase bile di ambil, judging from they way OSM and his friend tgh tgk belakang. 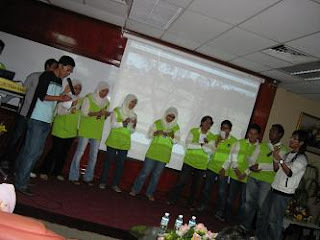 The final group, with collabration ngan their fasi telah jugak menjual my name during their performance haha.. Ni Faizal yg ngaku ek.. huh! 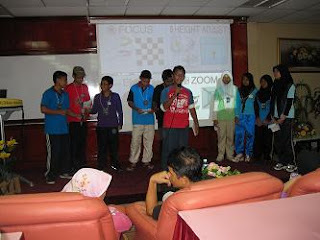 Sabo je laaa.. Takpe, ade ubi ade batassss.. hehe..
Then it was the junior fasi's turn to perform. The BEST performance of the night, may I add. Rugi tak leh masuk bertanding kan! 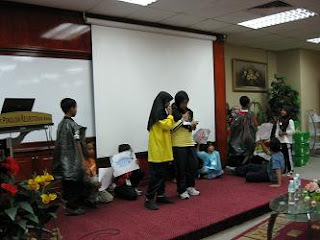 When it was our turn, sekali lagi my name dijual haha.. actually, time ni I felt like wanting so much for the floor to swallow me as the kids were chanting my name ramai² hahah.. but cam kate Arep, skrg dah jadi a very nice memory! Hmm, he's right.. but DURING that time, I really wanted to run!!! So then, it was our turn, the CMs of the project! Okay what kitorg nyanyi heheh..